You Can’t Spoil A Baby was founded in November 2011 by women’s health social worker turned stay-at-home parent and YCSAB Executive Director, Pamela Delisle. During her time as a social worker, Pamela met diverse, inspiring and resilient families, who, for various reasons, struggled within the current social safety net to provide for their growing family’s needs. The families needed more resources and they also needed empathy during this vulnerable transition into parenthood. Despite them living in poverty and having less privilege, they wanted to know that their children would grow up in a world where they mattered. YCSAB shows families that they are valued by their community by providing them with no-strings-attached resources to help them with their baby’s first year. 2011– YCSAB was born! Pamela recruited a small team of volunteers to be drop-off locations to collect baby items from her network of friends, family and local parenting groups. Volunteers began accepting and preparing donations in their homes for gifts that would then be delivered to Manitoba families in need, complete with a greeting card and big sibling gift. 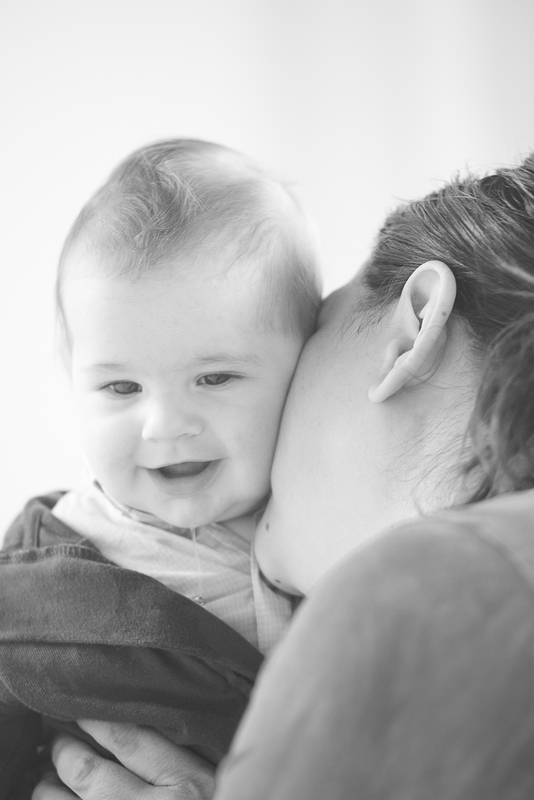 You Can’t Spoil A Baby gift recipient, enjoying a kiss from Mama. 2012– The YCSAB Facebook page was launched so that we could connect to our fans and potential donors, and to recruit new volunteers to our project. http://facebook.com/youcantspoilababy. By the end of 2012, approximately 125 gifts had been made and delivered by a team of 20 core volunteers. 2013-2015 – The “Make One Gift” volunteer position is created and launched to compliment our volunteers gift making efforts. To learn more about what Making One Gift or to apply to Make One Gift click here. YCSAB launches a private Facebook group to help our growing team effectively communicate, collaborate, and bond. The YCSAB website sees the addition of an interactive online map for donors to locate one of the over 20 drop spots in Manitoba where they can donate their once loved baby items. By the end of 2015, approx. 475 gifts had been delivered by a core team of 35 volunteers. 2016 – Introduced a request-management system to our gift fulfillment process. This tool streamlines the process of matching gift applicants to donors and provides us with data to measure our project’s performance. Issued @youcantspoilababy.org email addresses to our volunteers and single-sign-on across our technology tools. By the end of 2016, approx. 775 gifts had been delivered by a core team of 50 volunteers including a part-time volunteer Match Coordinator and Social Media Administrator. 2017- Fundraising begins to raise funds to register as a charity with Revenue Canada. YCSAB launches a Mother`s Day Campaign which sees 35 gifts to help with baby’s first year, delivered by Moms to Moms around Mother’s Day. YCSAB partners with Baby Box Company to distribute baby boxes. YCSAB grows to a volunteer team with 1 Founder/Executive Director, 1 Social Media Administrator, 1 Match Coordinator, 1 ‘Make One Gift’ Coordinator, 1 Volunteer Coordinator, 1 Executive Assistant, 1 Technology Analyst, 40 Gift Coordinators, 30 Delivery Coordinators, and over 40 Drop Spots in Manitoba. We are 80 strong and helping Manitoba families every day of the year! Our team is extremely proud of our progress and growth over our 6+ years. We acknowledge that our work could not have been done if it weren’t for the bravery and strength of the gift applicants who made themselves vulnerable by asking for help. Our vibrant team is motivated 365 days a year to find ways to keep up with our growing waiting list. We believe that every baby deserves an equal start and that all parents deserve to ask for help without judgement. The name of the project was inspired by a social work client of Founder/E.D., Pamela Delisle’s. This new mother shared a story of how every time she heard her baby cry from his crib, the baby’s grandmother would say to her, “Don’t go in there every time he cries. If you do, you will spoil him.” Her mothering instincts told her to go to her child every time, pick him up and soothe him. Yet the grandmother sounded so confident in her advice to leave the baby cry, the mother didn’t know what to do. Our name was chosen to remind parents that responding to their baby’s emotional needs immediately, consistently, and in a loving, compassionate way will help their baby grow into a secure child and adult. Our name also hopes to encourage our supporters to give generously so we can provide all babies on our waiting list with an equal start. Trust their baby and their parenting instincts because… You Can’t Spoil A Baby!